Gucci Timepieces & Jewelry is pleased to present its latest timepiece for men, the Gucci Dive. Available in stainless steel or pink gold, both worked in black PVD, this watch represents a new standard of high-performance timekeeping for Gucci Timepieces & Jewelry. The automatic movement is provided by Sowind, a true Swiss Manufacture that produces its own horological movements in the best tradition of fine watchmaking. By incorporating these components, Gucci Timepieces & Jewelry is improving its expertise, creating a niche segment of premium watches within its offering. These new models are distinguished by their blend of sleek design and superior mechanics. In order to carry the ‘diver’ title, genuine diver timepieces must conform to strict stipulations regarding underwater readability and pressure resistance. Among other requirements, diver watches must be water resistant to 100 meters, able to withstand salt water and function perfectly under water. An essential safety feature for all diver watches is the unidirectional rotating bezel, which measures the length of the dive. 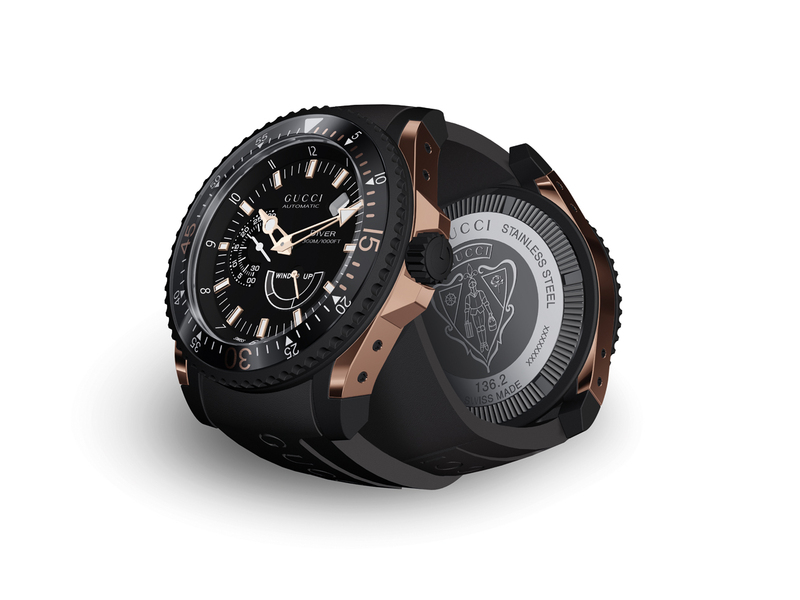 The new Gucci Dive timepiece meets these norms, adhering to ISO standard 6425 and the Swiss watchmaking standard for diver watches. For true sports performance, the Gucci Dive is equipped with a range of functionalities. It contains a Swiss Made GP3300 mechanical movement from the Sowind Manufacture with automatic winding mechanism and minimum power reserve of 46 hours – a first for a Gucci Timepiece. Internally, the watch comprises 241 parts, including an oscillating weight decorated with the Gucci diamond pattern, and 27 jewels. The dial shows an hour, minute and date display together with power reserve indicator at 5 o’clock and small seconds at 9 o’clock. The essential unidirectional rotating bezel shows a Luminova triangle at zero to indicate the starting time of the dive. The timepiece will function up to 300 meters (1,000 ft.). This extra-large watch (45mm) comes with a black rubber strap for sports wear, and a leather strap for everyday wear, both easily interchanged. A screwed case back is decorated with the Gucci crest. To ensure readability underwater to 25cm, hands and indexes are created in a silver tone with Luminova treatment (black version) or in a pink gold shade (black and pink variant) and Luminova coating. These functionalities are underscored by quintessential Gucci design that marries sporty attitude with style. Signature Gucci hallmarks can be seen in the Gucci script at 12 o’clock and an embossed Gucci logo on the rubber strap. Date at half past one, SWISS MADE at 6 o’clock.